Fractional payments aren't considered part of a quarterly dividend payment. Companies can improve their stock price through a reverse stock split. But the split rarely results in an even exchange, and companies don't want to have thousands of fractional shares on their books. Instead, each shareholder receives a cash payment in lieu of the fractional share value. Find your original stock cost basis on your brokerage statement. If you can't find your statement, calculate your cost basis by multiplying the number of shares you bought times the price per share. Using the following as an example, 150 shares at $5 a share is a $750 cost basis. Divide your original shares by the split amount to get the number of shares you now own: 150 shares divided by 20 equals 7.5 shares. Divide the original stock cost basis by the number of shares you now own to get your new cost basis: $750 divided by 7.5 equals a $100-per-share cost basis. Multiply your fractional share by the new cost basis to get your fractional share cost basis: 0.5 shares times $100 equals a $50 fractional share cost basis. Finally, subtract your fractional cost basis from the cash you received from the company to determine if you have a capital gain or loss: $50 cost basis minus cash-in-lieu of $20 equals a $30 loss. Determine if you held the stock less than one year, making it a short-term transaction, or one year or longer for a long-term transaction. 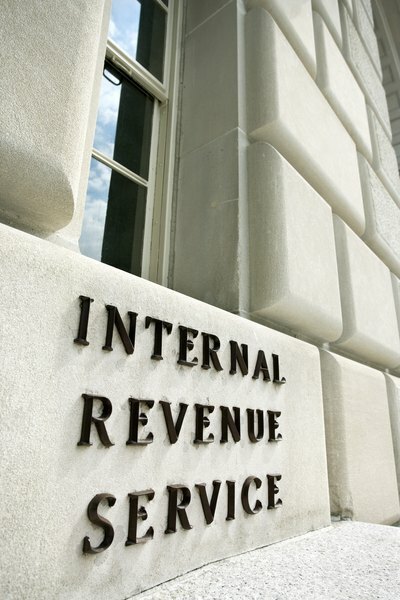 As of 2012, start with Form 8949 and check the appropriate box regarding IRS reported basis. Go to Part I or Part II, depending on how long you held the stock. On Line 1 or Line 3, Column A, enter the name of the company or its symbol, and the fractional number of shares. Skip Column B and in Column C, enter the date you purchased the stock. In Column D, enter the date of the reverse stock split. Move to Column E and enter the amount of the cash-in-lieu payment. In Column F, enter your fractional share cost basis amount. Skip Column G. Add Columns E and F and enter those amounts on Line 2 or Line 4 in Columns E and F. Transfer the totaled amounts from Form 8949, Columns E and F, to Schedule D, Line 3 or Line 10, Columns E and F. Subtract Column E from Column F, skip Column G, and enter the amount in Column H. Complete the Schedule D and transfer the final amount to Form 1040. Keep accurate records of your stock purchases so you can report the correct stock basis. Companies report their stock splits to the IRS, so you must disclose the transaction on your tax return.